The texture of tumbled tiles is ideal for outdoor areas where you’re concerned about traction. 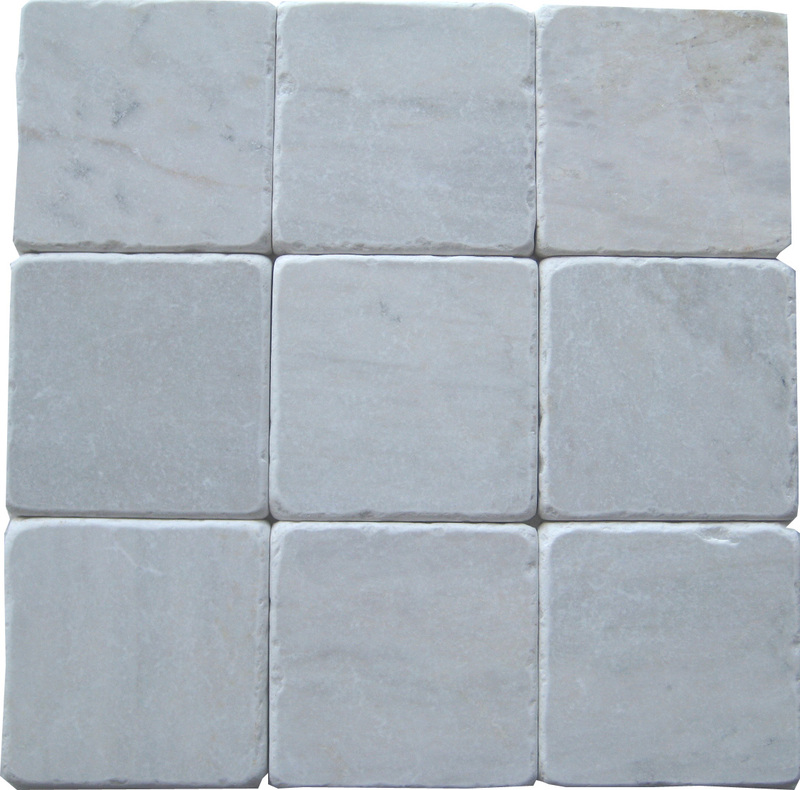 The small Bianco Carrara tumbled tiles are commonly used in bathroom floors, outdoor patios and even on pool decks. While they’re commonly put on walking surfaces, they’re far more versatile than this. The beautiful tiles are primarily white with shades of gray in them, and that makes them perfect as a neutral wall covering throughout a project. Whether you’re building a custom home for clients who are very particular about the design or want to impress a customer with your hotel designs, you’re sure to find plenty of uses for these elegant and durable tiles. If you want customers to know that you’re watching every little detail, then you should go with tile backsplashes in the kitchen. Customers appreciate the low maintenance and the sharp look. They’ve been around for decades, and they’ll continue to be popular because they’re resistant to heat and stains. Even a home with basic laminate counters will look more impressive when the small area above is covered with durable marble or impressive travertine. You can do one basic color in this field, but it will stand out and have a more polished look if you use a transitional border row. Use these tumbled tiles to make the visual shift from the countertops to the backsplash. You can use it as a contrasting color to make a kitchen feel larger, or stick with similar tones to help the backsplash blend together. The texture of this stone makes it stand out. Paired with high polished marble or granite, it helps to balance an area while adding visual interest. Borders are typically placed around items at the outer edges, but you can actually place a border or decorative stripe at any height. Use the Bianco Carrara tiles to form a vertical row right behind your showerhead to make the head of the stall more appealing. Install it at chair rail height around the entire bathroom. It can be used to cap off wainscoting in the basement or along the ceiling of your shower in place of crown molding. The four-inch-square tiles are incredible versatile and can be used in many applications and borders of all sizes. Even if you don’t use tumbled tiles for the flooring in an outdoor kitchen project, you may choose to use them on the walls. Take them beyond the backsplash of the grilling area to make the entire living space more elegant. If you have a raised roof, then you have support pillars. Rather than finishing the wood structures with stain, give them a better level of protection by covering them with tumbled tiles. It will look like the entire outdoor kitchen overhang is supported by stone, and that will please even the most discerning clients. Don’t underestimate how much a fresh texture can accentuate an area. A luxurious whirlpool tub has a smooth, polished finish that looks sharp against the texture of tumbled tiles. It’s an elegant way to draw more attention to the bathtub and ensure that your clients take notice of it. The sophisticated finish is perfect for all types of homes. You can choose to blend the colors together and make the spa look larger, or you might want to use contrasting tones on the apron for an impressive look that turns the Jacuzzi into a magnificent centerpiece of the bathroom. The trend among many builders is to go with affordable materials that bring down the cost of construction. The problem is that pressed board molding and cheap trims don’t last very long. Discerning customers know the difference between quality materials that are cost-effective and cheap materials that will leave them disappointed. Builders who are offering unique options and high-end materials that can last a lifetime have an edge in this market. In addition to showing your attention to detail with tile backsplashes, you can also make your brand more memorable by offering natural stone baseboards. Bianco Carrara tumbled tiles are the perfect choice for baseboards in kitchens and bathrooms alike. The four-inch size is more impressive than standard trim, and the natural stone can easily withstand the damp and hot conditions in these areas. Potential homeowners will appreciate both the look and the quality that’s being offered. The smaller size of these tiles makes them ideal for framing fixtures around your project. Plain mirrors that are glued to the wall are used in many commercial restrooms, but you can create a more upscale look by adding a border of Bianco Carrara tiles. Use them around mirrors, window frames and other built-in features. It draws more attention to the attractive fixture and will make the finished project feel more elegant. Following the same theory of framing a fixture, use a mixture of Bianco Carrara tiles and a contrasting tile like Adalis Cappuccino or Rojo Alicante. Make a simple fixture like a basic vanity and mirror stand out by creating a tile wall in the background. Use the darker color to make a border on the wall, and then fill the center with the creamy shades of Bianco. Mount the fixtures directly to the tiles for a look that will never fade out of fashion. This is ideal for commercial settings and homes alike. These small tiles are tumbled for texture and ideally suited to use in exterior settings. While you may love the idea of putting them around your pool, you can also look to vertical surfaces that deserve to look more impressive. Make your front porch more impressive by adding Bianco Carrara tiles in lieu of faux bricks. The light color will reflect light to make the porch brighter, and it will make your magnificent front door stand out more. Use it to cover part of the wall your door is on, or use is as the framework for house numbers or some attractive artwork. If you have elegant columns that rise up to a finished ceiling, have the columns covered in marvelous stone tiles for a timeless, classic look. Inside and outside the home, you need something impressive for your stairs. If the treads are finished with tile or wood, you need to consider how you’ll handle the risers of the stairs. Cover the risers with natural stone tiles for a durable backboard that is resistant to damage like stains, scuffs and cracks. With the tumbled tiles and water resistant finish, you can use them on a grand staircase in a hotel lobby or the rounded stairs leading to the front door of a custom home. When you’re working up design plans, choose high-end materials that will attract top clients. You can still save money by choosing to work with a wholesaler that offers low prices. Here at Nalboor, we own our overseas manufacturing sites, which means we maintain excellent quality control standards. We’ve taken the middlemen out of the equation to reduce markups and pass the savings on to you. Our merchandise is carefully packaged and shipped to minimize breakage and ensure that you enjoy a positive experience. Contact Nalboor today to review our inventory, to a get wholesale quote through our online form, or speak with our representatives about placing an order.